If you are learning how to invest, you probably have encountered the term “valuation.” If you are overwhelmed by the complex words that typically “explain” what valuation is, you’ve come to the right place. Here, we explain how valuation works and how you can approach investing strategically in a very easy to understand manner. What’s the purpose of investing in the place? It’s to make money, which we also refer to as investment return. Money, however, is almost never free. In investing, return and risk are joined at the hip. Every financial product, including stocks and bonds, is meant to represent some level of return given some amount of risk. For instance, short-term US treasuries (also referred to as monetary market) are regarded as one of the safest assets in the world, and hence typically carry a very low return for its investors. Private equity and venture capital, on the other hand, are regarded as two of the riskiest assets in the world, and investors demand an extremely high potential return to buy such assets. 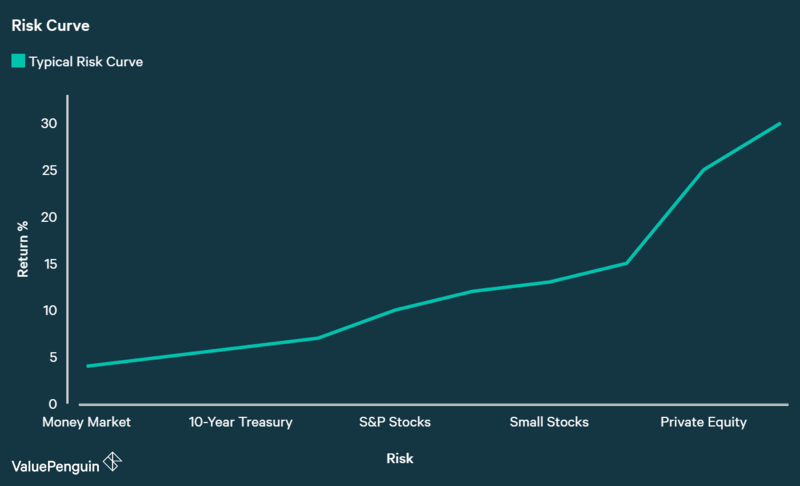 This characteristic of financial products is collectively described with a chart called the risk curve depicted below. In light of risk & return, “valuation” is a way of putting a price to a financial asset as a way of measuring an asset’s potential return. Just as you would happily pay S$2 for a cup of coffee because it’s cheap (or be unwilling to pay S$50 for the same cup of coffee), a stock or bond comes with a price tag as well. A financial security’s worth is based on the total amount of money one can earn by owning the asset. Typically, an asset is "cheap" if it offers a high return on investment compared to the risk it contains. For example, a bond from Company A that yields 8% could be perceived as being cheap if all other corporate bonds from companies with similar caliber as Company A only offer 4%. A stock's cheapness is typically measured by a metric called Price/Earnings Ratio ("PE Ratio"), which is calculated by dividing the stock's price by its earnings per share metric. A PE Ratio is essentially an inverse of interest rate that allows comparison between a stock and a bond. For instance, a stock that has a PE Ratio of 10x offers 10% (1/10) return to the investor, which is higher than interest rates offered by most investment grade bonds. While you can read more about the basics of a bond in our guide, we will summarize briefly what a bond is and what affects its prices. Buying a bond is essentially a form of lending. By buying a bond, you are lending money to the bond issuer, typically governments and corporates, that promise to pay you back the money plus interest at some designated time in the future. Typically, they are priced at S$100 to S$1,000 of “par value.” This means that for each share of a bond, you are owed the par value (S$100 or S$1,000) per share plus promised interest at maturity of the loan. Valuation of bonds typically depend on the prevailing market interest rate, risk profile of the borrower, and maturity of the bond. For each market, the government’s bill interest rates set the base line on which all other bonds are priced. For instance, if the Singapore Government Treasury bill is priced at 0.9% interest rate, then a corporate bond might carry an interest rate of 4% given that a company is a less “safe” borrower than the Singapore government. Below, we explain different strategies of investing in bonds by prioritizing how each factor impacts a bond’s pricing. The simplest way of investing in a bond is to “buy and hold.” For example, you could just buy a bond at issue for the full par value of S$100, and earn a promised interest rate of x% per year until maturity. As long as the issuer (the borrower) does not default on its loans, you will earn your promised return. Sounds simple, right? However, there are some factors that could spice things up a bit, like changes in interest rates and credit worthiness of the borrower. We explain them one by one below. There are many macroeconomic factors that could change the market interest rate. For example, a central bank could decide to lower rates to stimulate its economy. Or, a competing nation’s currency devaluation could prompt your government to lower interest rates to help the country’s exporters. Because bonds are priced with interest rates, these changes could impact bond securities’ prices. For instance, let’s assume Company A issues a 5-year bond with an interest rate of 5%. Such a bond would be trading at par value of S$100 in the beginning. All of a sudden, market interest rate (i.e. Singapore Treasury Bill) declines for a variety of reason from 1% to 0.5%. Such a move naturally prompts a comparable Company B to issue bonds with a lower interest rate of 4%. Given that Company A’s bond had promised 5%, the investor community would love to own Company A’s bond over Company B's bonds. The rise in demand would inflate Company A’s bond’s par value from S$100 to S$125 so that the S$5 of interest (5% of S$100) will be equivalent to 4% being offered by other bonds in the market. This would mean that you could trade bonds on your outlook on where interest rates will go. If you expect interest rates to fall over time, you could buy bonds now that are yielding high interest rates and wait for bond prices to rise. On the flip side, if you think interest rates will rise, you could short bonds to bet that bond prices will fall. Also, it’s crucial to remember that even if the par value declines or rises because of interest rate changes, a bondholder ultimately receives the full S$100 back at maturity. He would be earning a higher or lower interest rate than they would otherwise, but ultimately he will receive what he was promised when the bond was issued, so long as the issuer does not default. This implies that some losses in bond investments are not always permanent, and can be recovered as long as you hold on to the bond & and can be confident that the borrower is perfectly capable of paying back your money. One last strategy in bond investing we wanted to highlight is sometimes called a “negative art.” This is because bond investing can sometimes be just about ruling out the losers instead of picking the winners. We explain how it works in laymen’s terms below. Besides interest rates, another major factor that influences a bond’s price is the borrower’s credit worthiness. While a bond may be issued at full par value, its price can decline significantly if the borrower’s ability to repay the debt declines meaningfully. The most extreme example of such a case is bankruptcy, when a company has to close down its operations because it is unable to repay all of its debt. More mild cases include sudden increase in debt or sudden decline in profitability of a company. One principle you must always remember about bonds is that a bondholder can receive all of his money back at maturity as long as enough money comes out of the company to cover its debt obligations. While this usually means that the borrower’s business has to generate enough profit, it also means that there are other ways of “getting money out of a company” even in cases of bankruptcies. For example, court proceedings will usually involve an auction process of the bankrupt company’s assets to recover enough cash to pay back as many debt holders as possible. Take a look at our example below. Let’s assume Company A has S$1bn in debt obligations and S$3bn in assets like cash, inventory, plants, property and equipment. It has declared a bankruptcy because its unprofitable operation is bleeding cash and the company is unable to pay back its debt. Believing that the Company A will not be able to pay its moneyback at all, Company A’s bonds have declined in value from S$100 to S$1. However, Company A’s cash and the profit from asset sales combined to a sum of S$900mn, which is used to pay back 90% of the liability that Company A had. In such a case, the bondholders could receive S$90 per S$100 of bond they originally owned. If you had bought the bond when it was trading at S$1 before the auction happened, you could heave earned up to 90x your money! While not all real-life scenarios work out this simply (there are other factors like which debt holders get priority), bond investing can be highly profitable for investors who can do enough research and build conviction that certain issuers will be able to payback their debt. When decline in credit ratings of bond issuers cause bonds to decline in value, sometimes merely making sure that the issuer can and will payback some or all of its liabilities is enough to profit from your investments. Determining a fair value of a stock is a bit more complicated than doing the same for a bond. However, the basic principle is still the same. True worth of a stock is equal to the amount of money you can generate over time by owning the stock. A critical strategy to always remember when investing in stocks is to purchase stocks at a discount to their fair value. When you are trying to buy low and sell high, the easiest way to do so consistently is to buy things that are temporarily on sale and sell them at a full price. There are two most common methods in valuing equities: Discounted Cash Flow and Multiples. We explain their principles and usage one by one. A DCF valuation method is a way of valuing all of the cash profits of a company over the course of multiple years. What this calculation method captures is the time value money: a dollar today is worth more than a dollar next year because of inflation and interest rates. For instance, a coffee might cost S$5 today, but it might cost S$5.15 next year because of 3% price hikes across the country. Not only that, if you invest a dollar today even at 1% interest rate, you would have S$1.01 next year, which is better than starting with a dollar next year. To capture this, analysts first project how much cash profit a business can generate over the next few years. Then, they discount such “cash flow” by what is called a “discount rate.” Then, by adding up all of the discounted cash flows over a company’s life you can estimate the fair value of the company. This is illustrated by the formula below. If you actually do the math for any company, however, you will see that this process is not as scientific as it seems. For one, how should you determine the discount rate? Should it be 10% as people usually assume? Or should it be 8% since interest rates and inflation rates are so low globally? Such a seemingly simple assumption can have huge impact on your estimate. Because of this, analysts also like to use another method of using “multiples” to evaluate a stock. We explain this concept in the section below. The most common type of multiples that you may have heard of is the PE Ratio (Price to Earnings). It is calculated by dividing a stock’s price by its earnings per share (i.e. net income per share). As we mentioned in the beginning, it is essentially an inverse of interest rate that allows comparison between a stock and a bond. For instance, a stock that has a PE Ratio of 10x offers 10% (S$1 of net income per S$10 of stock price you pay to own the stock) return to the investor, which is higher than interest rates offered by most investment grade bonds. Multiples are most commonly used to compare stocks to each other, and should not be viewed in a vacuum. Let’s look at an example. Company A and Company B are both trading at 15x PE Ratio. However, Company A is growing its business at 20% while Company B is growing at only 2%. This would imply that Company A is cheaper than Company B on next year’s multiples. As you can see, Company A’s stock is trading at 11.5x next year’s EPS while Company B’s stock is trading at 14.7x next year’s EPS because of their different growth rates. The example above illustrates two important principles in using multiples. First, you must take into account the health of a company when evaluating its cheapness. If the company’s business declining rapidly, an 8x PE stock may actually be trading at 16x PE on a forward basis. While many pundits regard value investing & growth investing as two separate disciplines, you should really think of them as being joined at the hip. A company that’s trading at 20x PE could be trading at 10x in a few years because of its high growth rate. As a rule of thumb, you should aim to earn at least 8% to 12% annually on your stock. There are many ways of achieving this goal; just to name a few, you can: 1) buy cheap stocks that are underappreciated by the market, 2) buy growth companies with deep moats and management teams that at decent prices, and 3) exploiting relative value disparities by buying cheap stocks and shorting expensive stocks. Secondly, it’s generally recommended to compare a company’s stock price to its peers’ stock prices. It might be helpful to think of it as shopping. For everything you buy, you compare and contrast each product and its price points before making a decision. Why buy a Gucci bag for S$6,000 if Louis Vuitton bag of a similar caliber is available for S$3,000? You should do the same with stocks. If you can choose from a pool of companies with similar caliber (taking into account many factors like quality of management, growth rates, competitive threats, etc. ), it’s generally advisable to pick the cheapest of them all. Just do research to make sure that LV bag doesn’t have some meaningful damages that you may have missed. Besides PE ratios, there are other multiples like PEG, P/Book, EV/EBITDA and EV/Sales ratios. They each have different use cases & rationale. We prepared brief explanations for each so you can have some basic idea on how to understand them. PEG is simply PE ratio divided by the company’s growth rate. I typically like to use the growth rate of a company’s revenue instead of EPS. By incorporating growth rate into PE ratio, this measure attempts to find a balance between value and growth. Although there are many opinions on this matter, a PEG of below 1 is generally regarded as cheap. Price to Book ratio is calculated by dividing the stock price by a company’s book value per share. Book value is simply the equity value recorded on a company’s balance sheet, and it represents the amount of capital that investors have actually poured into a company’s operation. For instance, if you spent S$100,000 to open your restaurant out of your own pocket, that would the book value of your restaurant. If you use the profits from the restaurant to grow your business (hiring more chefs, buying more equipment, etc. ), those would be additional equity investments into the company. In theory, a stock might be a bargain if you can buy it for less than what investors have originally put into the company, meaning P/B ratio would be below 1x. However, usually P/B ratios are tied to a measure called Return on Equity (ROE), which is calculated by dividing a company’s net income by its equity. Remember, you are trying to earn about 10% per year on any stock. If a company earns 10% ROE, it means it is generating $1 of profit for S$10 of equity investment in the company. How much would you need to pay for such a company to generate a 10% annual yield? It would be 1x P/B. In this case, it also translates to 10x P/E Ratio. Generally speaking, P/B ratios are most often used for financial companies like banks and brokerage firms. As a simple rule of thumb, you should compare ROE and P/B ratios. When dividing ROE by PB ratio is more than 10 (i.e. 20% ROE divided by 1.0x P/B ratio = 20), a stock could be regarded as “cheap,” though other factors should also be carefully considered like growth rates, and sustainability of the ROE. EV stands for Enterprise Value, which is the total value of a company including its cash and debt. It is different from a “market cap” which only measures the value a company’s stock (or equity). EBITDA stands for Earnings Before Interest, Tax, Depreciation and Amortization. EV is used to compare against EBITDA because these two measures represent values to all of the stakeholders including lenders. In contrast, PE ratios only consider stockholders because net income is the profitability after interests have been paid to banks and bondholders. EV to EBITDA is an alternative to P/E ratio when a company carries high level of debt, or requires a heavy level of capital expenditure (i.e. building factories). These two factors can depress a company’s earnings artificially or temporarily because of interest payments and depreciation charges. For example, it is often used to value utility or telecom companies that often borrow a lot of money to fund their heavy upfront investments. Because these companies tend to report low profits even when they are generating a lot of cash flow, analysts often use EV/EBITDA ratio to value the true worth of their economics. EV to Sales ratio is usually used for software companies. This is possible because 1) software companies generate 90% gross margin and 2) they can often retain their customer base & revenue without spending much money on operation (like research or sales), and make 90% profit margin quite stably. True, most software companies rarely actually operate the way we describe in the second scenario. However, the possibility of doing so if the company so chooses creates a rationale for using EV/Sales ratio. Because revenue can be translated into profit almost entirely, EV/Sales becomes similar to a PE ratio. There are many other ways of assessing a company’s value. For one, you could try to assess what a motivated and strategic buyer would pay to acquire a company. For example, what would Facebook want to pay to acquire Snapchat? Another method worth mentioning is replacement value, which is often used for industrial companies with manufacturing facilities. For instance, if a company that manufactures DRAM owns factories that cost S$10bn of investments to recreate, that company’s stock might be cheap if it’s being valued at only S$5bn. Above principles and strategies are just some simple ways of thinking about investing in stocks and bonds. Actual investing takes a lot of effort, research, patience and discipline to bear fruit. What’s most important, however, is that you firmly believe in your strategy because it makes a logical sense. We hope that our summary here has helped you build a better understanding of how to value financial assets, and we hope that you take this to a new level by putting them into practice in ways that make the most sense to you. If you are ready to tip your toes in the water, you should first find the best online brokerage in Singapore that works your needs. While there are many things to consider when shopping for one, it's useful to compare each broker's commission rates and different kinds of services that are provided. You should get a good sense of how often you would want to make transactions, and how big your portfolio will be. Also, there are services like margin financing and short-borrows that you might want to consider depending on the strategy you end up adopting.